The first aircraft in the Hellenic AF wearing the grey-blue colour was Mirage F1CG in 1975 (in original French scheme). 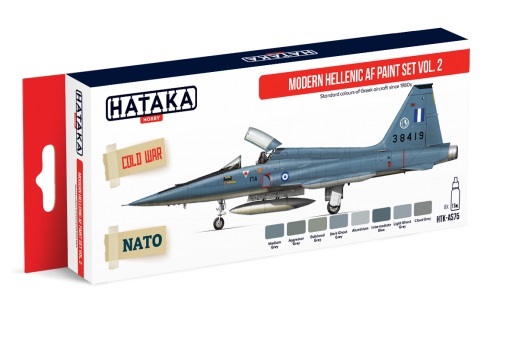 Shortly afterwards the pilots of HAF requested to repaint the remaining interceptors into the "Aegean Blue" scheme. In early 1980s F-5As and F-4Es were repainted (at first using a mix of blue and grey, later standardized as FS35164). The first Greek "Ghost Scheme" painted aircraft was an F-16C Block 30 in 1988. The HAF opted for the new colours as majority of its missions is conducted above the sea (the scheme was the same as US Navy F-16N pattern). The first F-5A was repainted to "Ghost" in 1992, while the first F-4E in 1997.